“Above all, my brothers, do not swear, either by heaven or by earth or by any other oath, but let your ‘yes’ be yes and your ‘no’ be no, so that you may not fall under condemnation” (James 5:12). When Jesus told His followers that they were not “of the world” (John 15:19), He was making the point that, fundamentally, the church is to be counter-cultural. On every page of sacred Scripture, God continually calls us to live according to His wisdom and not according to the wisdom of this fallen world. The pressure to submit to the world’s values has always made it difficult for the church to heed this admonition. While facing many difficulties, the original audience of the book of James was beginning to act in ways contrary to heavenly wisdom. Their reluctance to be doers of the Word (1:22–25), especially in the use of the tongue (v. 19; v. 26; 3:1–12; 4:11–17), made it urgent that they repent (vv. 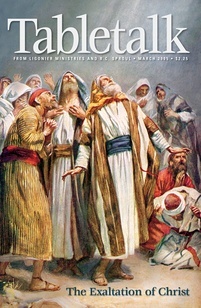 1–10) lest they be guilty of having an empty profession of faith (2:14–26). In today’s passage, James begins the concluding section of his epistle. This section contains exhortations that focus on the godly use of the tongue. This should not be surprising, for if our works demonstrate our faith, then good works of the tongue are also necessary fruit of authentic faith. James 5:12 repeats the teaching of Jesus regarding oaths almost verbatim (see Matt. 5:33–37). Among the New Testament authors of epistles, James is most likely to quote Jesus directly although the substance of Christ’s earthly teaching is found on every page of Scripture. That James is quoting Jesus here helps us to see that like Jesus, he is not forbidding the use of oaths altogether. Next week we will discuss Scripture’s teaching on oaths and vows and see how James 5:12 fits with the commands found elsewhere in the Bible regarding vows. For now we will simply say that there are many appropriate circumstances in life where oaths and vows are to be made. James is not discussing these areas; rather, he is speaking of everyday speech in the Christian community. As Christians, our word is to be trustworthy so that we need not swear oaths every time we make commitments and promises to one another. If our speech is untrustworthy so that we feel the need to swear our truthfulness in all of our conversations, then perhaps we have not truly embraced the Gospel. John Calvin writes that if James’ audience “observed faithfulness as they ought, in their words, there would have been no necessity of so many superfluous oaths.” How trustworthy is your speech? Can people believe what you say? Do you see no harm in telling “little white lies?” If you have been guilty of being less than truthful in your speech, then go make amends with those you have offended and ask the Lord to help you make your tongue always speak the truth.